St. Mary's, Glaziers Lane, Normandy. Although there were Catholic families living in and around Normandy, practising their faith together and establishing places for worship had been very restricted. Today their main Church is Holy Angels, Ash but records are available only from 1904. In 1927 a mission centre was established in Normandy, one of four, attached to The Southwark Catholic Itinerant Mission with Father Arthur Dudley as the Diocesan Missioner, joined in 1929 by Fr. Francis Bayliss. The Headquarters of the Mission was at a house called St. Ann, St. Paul's Road, Dorking. There were 44 Catholics in Normandy at that time. 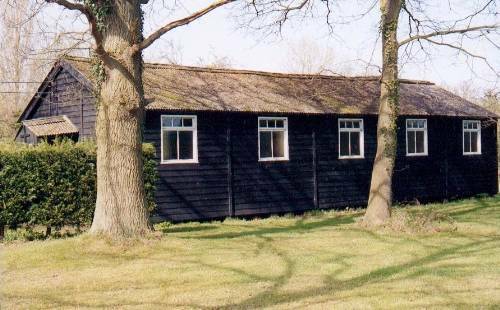 Services were held in the village hall, and there are stories of Frank Chant collecting the congregation from Mytchett, Ash and Normandy in his van with people sitting on slatted seats, peering out through small windows. The Mission priests Frs. Dudley and Bayliss administered the small "flock" in Normandy and were joined later, probably in early 1931, by Fr George Winham. The temporary "chapel" at the village hall was, however, served regularly by Fr. Bayliss. In August 1931, F G Gaskin, the father of Fr. Kevin Gaskin, brought from Ditchling, Sussex by tractor and trailer, a wooden building used previously by Canadian Army Officers during World War I. It was re-erected in just over a month on land given by Mrs. Milton, a devout Catholic and wife of Arthur Milton, the owner of Manor Fruit Farm. Initially the building was designated as a "Chapel-of-Ease" but in 1932 attained "Parish Status" when Fr Bayliss became Resident Priest, remaining so until 1934. A church for Catholic families was now firmly established. The main structure of that original building is the shell of the present Catholic Church of St. Mary, Normandy. An extract from the very helpful booklet on the church produced by Joe Widlake in 1981 describes the opening ceremony of the church in 1931. "No official account of the opening ceremony and Mass is to be found in the records relating to Our Lady, Queen of the World at Normandy. An insight into the warmth and humanity of Normandy people is that few recall the splendour of the opening ceremony or the dignity of the Mass that followed. What sticks in the minds of many, who were present that day, was the fact that when the solemn procession of priests in their splendid vestments, remember the days of the biretta and maniple, had filed out to begin Mass, the sacristy door promptly fell down!" Father Healey, an Irish priest, was by repute, robust and jovial. He came in 1935 serving for 14 years until August 1949 when he was moved to the parish of Redhill. Fr. Healey lived in the house next to the Holy Angels Church, Ash, built in 1935. The financial strain of administering Ash and Normandy was not lightened until the arrival of Fr. Peter Dorman in April 1951, a retired Colonel with an independent income derived from his Army pension. He continued to serve both Ash and Normandy for 20 years. With the opening of the new church at Mytchett his administrative skills were called upon to re-arrange the times of Mass to cope with the additional workload. It was during the hectic period of the late 1950s that the church was served by others such as Fr. O'Flynn, of the Salesians, and a supply priest Fr. Fox, then a Professor of Theology at Wonersh Seminary and now the retired Bishop of Menevia, Wales. Over the years many people have given loyal support to their church. Ann Dent, a local journalist and John Ades, one time Mayor of Guildford, have been Lay Readers. Evelyn and Eric Gorniock continue to send news to "A & B News", the newspaper of the Diocese of Arundel and Brighton, as part of their responsibilities. Joe Duffy and his wife Daisy gave many years of practical help and Mr. and Mrs. Charles Merrett were presented with the Bene Merente Award from the Diocese for all their devoted work to the church. Similar duties and responsibilities continue to be undertaken by helpers. The congregation celebrated their Golden Jubilee in 1981, and the Mass was attended by the elderly Fr. Dorman, and Fr. Wilson, the Priest at that time, who accepted two golden chalices given by Molly Llanwarne, Glaziers Lane in memory of her husband Don. In 1998 Brenda Hardy, previously Brenda Robison of Halsey Cottage, Glaziers Lane but now re-married and living at Milford-on-Sea, presented a green chasuble to the church in memory of her late husband Wally Robison. During the four years of administration by Father Liam O'Connor, the church benefited by new carpets, benches and curtains. In 1986 his Bishop transferred him, just like Fr Dorman, to Redhill and was quickly succeeded by Fr. Kenneth Freeman, Fr. Emmanuel Agius Maltes, a White Missionary Father, and by repute, was a very jovial character and then finally in 1989 by Fr. John O'Donohue. Fr. Stanley Burt was the Priest for the last eight years of the Church. After Fr. Stanley Burt's retirement in February 2001 Fr. Martin from Farnham was appointed as Parish Priest at Holy Angels at Ash. Soon the Church of Holy Family at Heath End, Farnham was added to Holy Angels parish. Sadly Fr. Marlin died suddenly after 8 months. In June 2002, Fr. David Osborne, a newly ordained priest was appointed. St. Mary's in Normandy was closed as the wooden structure was now 71 years old. 8 small houses have replaced St. Mary's, which is now called Milton Close in grateful memory of the Milton family, the original donors of the land for St. Mary's in 1931. In 2009 Fr. David Osborne was moved to Cranleigh, Surrey. In late 2009, Fr. David Buckley was appointed Parish Priest of Holy Angels, Ash.